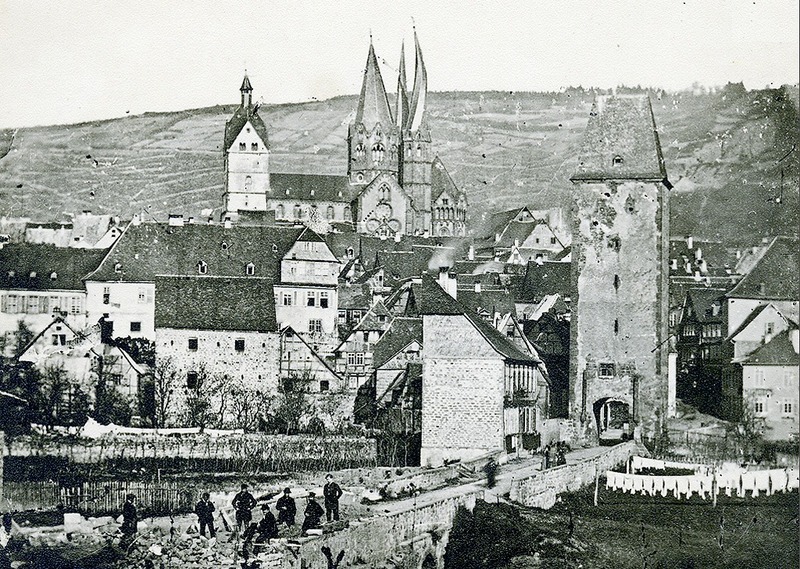 The narrative left to us by Heinrich Wilhelm Hayn, (brother of my husband’s great- great-grandmother Caroline Hayn Hellfeld), tells a fascinating story of life in upper middle class Europe in the 19th century. It has all the earmarks of a good historical novel – a rags to riches story line, humorous anecdotes, a family dynasty, successful careers, exciting travels, wars and pestilence, cultural and technological achievements, joys and heartbreak. Born into a prominent coffee import family based in Frankfurt, Onkel Hayn’s career took him to Rotterdam, Antwerp, London, and Le Havre, before WWI robbed him of house and fortune. Although his wife died young, he never remarried, and filled his leisure time with social activities, cultural pursuits, and travels, including several to the Swiss mountains. His narrative begins with his grandfather’s youth, and ends around 1918, with countless events described and more than 100 people named in the course of the 276 pages. His elegant writing style, keen sense of observation, and attention to detail makes it a worthwhile read for anyone interested in learning about how past generations lived. Had it not been for my husband’s maternal grandmother, who arduously typed Onkel Hayn’s written manuscript shortly before her death, his words would most likely have forever remained locked in a dusty book on a shelf. I can assure you that no one else in the family would have tackled the task of deciphering 300+ pages of “Kurrent” without knowing in advance if it was worth the effort involved. And in fact, even though I spent many hours unraveling the mysteries of incorrectly transcribed words and names, I still feel like I am hardly any better at it than I was when I started. So what exactly is this handwriting style, and why is it so difficult? 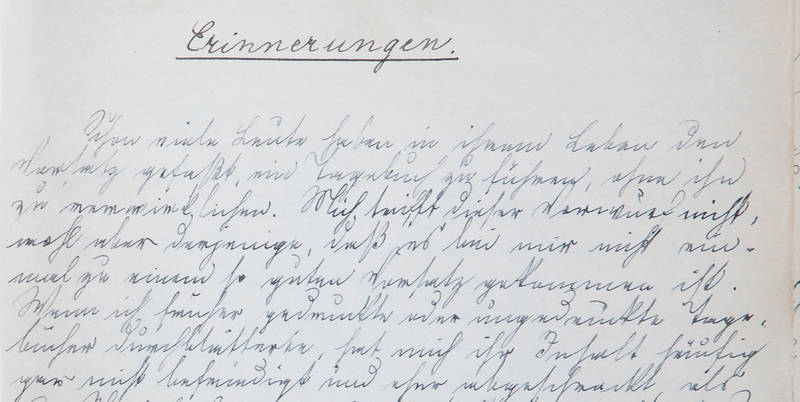 For an answer to the first question, I would suggest a look at the excellent post, “Kurrent – 500 years of German handwriting” by Ralph Hermann. He explains that Kurrent is essentially the handwritten counterpart to the typeface Blackletter (think Gothic script), which gives it an “edgy” look, as opposed to the more curvaceous Roman cursive, which has Roman block letters as its typeface relative. He also includes examples showing how the script evolved over the centuries. Posted in Conventions. Bookmark the permalink. On my husband’s most recent business trip to Brussels we devoted our Sunday to a walk around Antwerp, the city that represented the second rung of the corporate ladder in Onkel Hayn’s career. He was just 21 years old when he arrived, but had already spent almost three years in Rotterdam working for his cousin Ludwig Wilhelm Schoeffer, son of one of his father’s sisters. 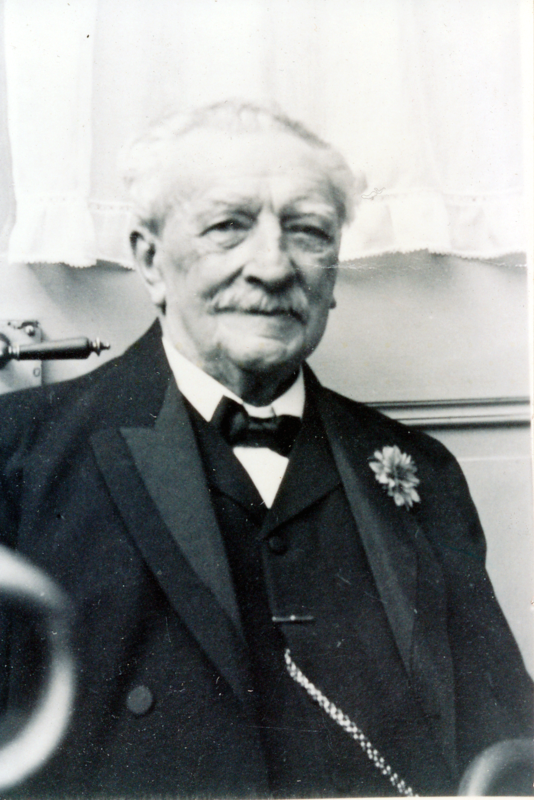 His employer in Antwerp was the son of another sister, Heinrich Eysenbach, who had started his business in 1853 and by January 1866 owned it outright. Unfortunately, he was not bound to enjoy his success for very long, as an unnamed illness (possibly tuberculosis) put an end to his life at age 39, only a year after Onkel Hayn’s arrival. Antwerpen war schon durch seine glorreichen geschichtlichen Erinnerungen an und für sich ein viel interessanterer Aufenthalt als Rotterdam. Auch das Äußere bot mit seinen stattlichen und vornehmen Gebäuden einen schöneren Anblick, als die einfachen und eintönigen Backsteinbauten von Rotterdam. Das bemerkenswerteste Gebäude ist die Kathedrale mit dem schönen spät gotischen Turm. 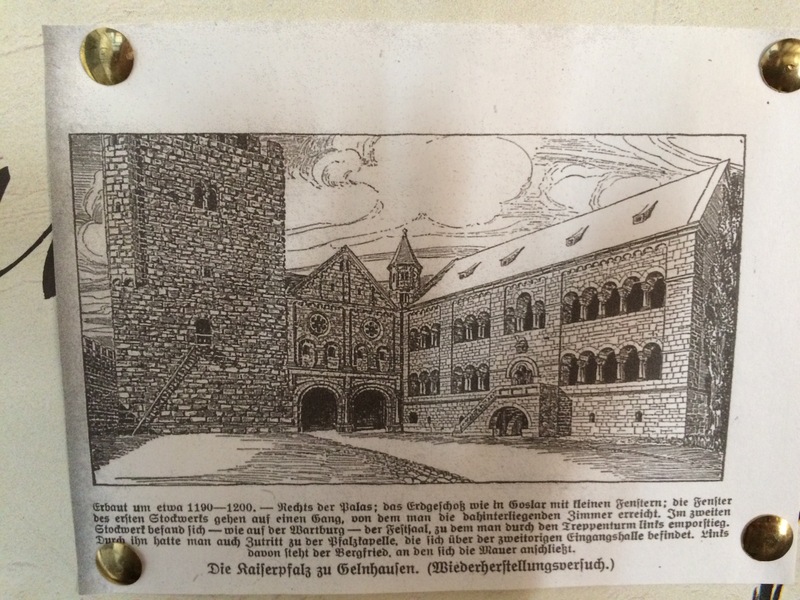 Aus der spanischen Zeit stammen noch viele interessante Gebäude, wie der „Stehen“, ein Teil der alten Burg und Sitz der spanischen Inquisition, das Rathaus etc. Ebenso verschieden wie die beiden Städte im Äußeren, sind deren Bewohner in ihrer Lebensweise, Sitten und Gewohnheiten. Der Holländer hat einen ernsten, zurückhaltenden, sparsamen Charakter, der Flamländer ist ungebunden, lebenslustiger, freigebiger und oberflächlich. Das öffentliche Leben ist in Belgien freier und ungebundener; man hält da nicht so streng auf die Etiquette. One of the buildings he didn’t mention in detail was the Commodities Exchange, where he spent every working day. 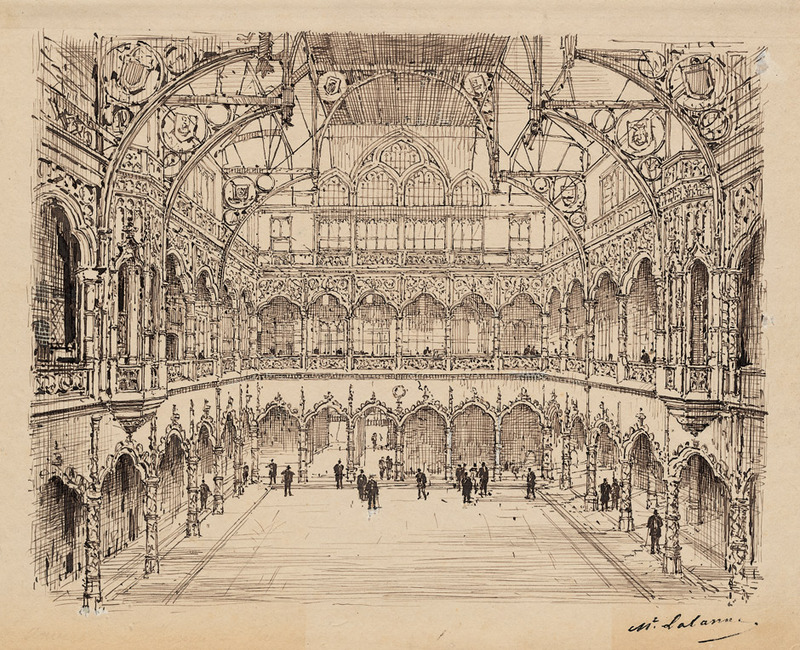 This surprised me on first read, because the (unfortunately now condemned and barricaded) building is a magnificent structure, and its predecessor presumably also famed for its architecture, with a roof which resembled the Crystal Palace in London. What I failed to take note of, is that the building burned down in 1853 and was not rebuilt until 1872, meaning this was not the building that Onkel Hayn would have conducted business in. No wonder he was so silent on the subject! Alas, one can’t even peek inside since all doors and windows are boarded up. However, professional photographers have been allowed access and their photos are magnificent. There has been talk of renovating the building and turning it into a hotel, but unfortunately the project does not seem to be moving forward at this point. In closing, I think if Onkel Hayn were to visit Antwerp today, he would find it in many ways similar to what he knew. The historic district looks much the same, the street and most likely the house where his employer lived still exist, and the people are still open, friendly, and “lebenslustig.” In fact, I always get the impression that the locals are on permanent holiday in their own city. In any case, we had no problem spending three hours at an outside table of a 300-year-old restaurant, enjoying the “ambience” of the city, and feasting on mussels and frites (of course washing it down with some very fine “grape juice” as my husband likes to call it). Cheers to you, Onkel Hayn! Posted in Re-tracing Steps. Bookmark the permalink. Christoph Alfred Hayn was Onkel Hayn’s only child. He was named after Onkel Hayn’s older brother Christoph, and his wife’s brother Alfred. Left motherless at age 5, Alfred spent his early years with his father (first in England, then France), and later went to live with his aunt Caroline (the same sister Onkel Hayn lived with at the end of his life ) so he could complete his education at a German school. We also know from the memoirs that made a trip to the US in 1907, that he was interred at Knockaloe on the Isle of Man during WWI, and that after the war he and a partner were in charge of the Hamburg branch of the family business. But here the narrative stops. Stories circulating within the family are oddly pejorative, and/or completely misinformed – that Alfred had died in WWI, that he was probably mentally retarded, was sickly, and possibly gay. Many of the family photos with his name on the back are clearly of different people, as if no one really knew who he was. So, I made it my task to “find Alfred.” Every so often I would start a new online search with different keywords, and joined various genealogy sites to gain access to their databases. I found references to the business in Hamburg with his name attached to them, so assumed that his activities in Hamburg are what prevented him from taking care of his aging father. I found no references to a wife. But when did he die? I tried finding his name in cemetery databases, in Google books, you name it, but nothing. Then, last week, after making a few updates to the online family tree, his death certificate popped up. Eureka, I found Alfred! It was like a belated Christmas present. Unfortunately no cause of death was listed, but he died at home in Hamburg in January 1931, shortly after his 51st birthday, and 8 years before the death of Onkel Hayn. So maybe that is him on the photo from October 1930, where he is identified as one of the guests at a family wedding in Switzerland? If so, he certainly did not look sickly, or mentally retarded, in fact he looked happy and congenial. I certainly hope he was, may he rest in peace. 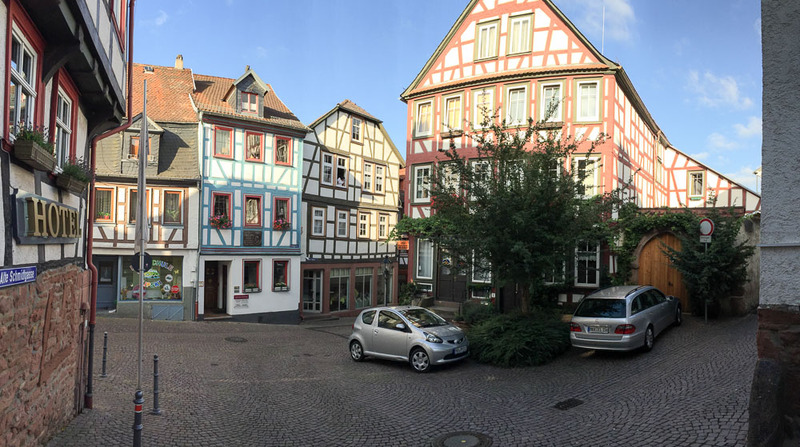 As recounted in my previous post about our trip to Gelnhausen this summer, the first half day of our whirlwind 24-hour tour was spent visiting the homes once owned by the family of Onkel Hayn’s Aunt Schöffer (one of his father’s sisters), attending a concert in one of the homes, and meeting two of her descendants. 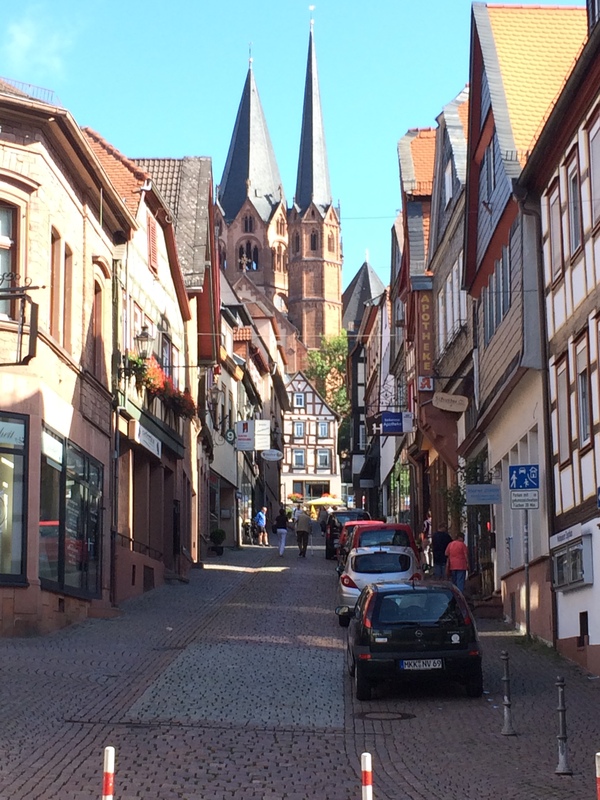 Our second half day started out with an early morning stroll around town, admiring the half-timbered houses, the cathedral, and the two picturesque town squares (Obermarkt and Untermarkt). It just happened to be the day of the annual flea market, so all cars were banned from their usual parking spots to make way for the vendors and their stands (in fact we got a call from the hotel reception at 6am telling us to move our car – luckily we had read the signs and taken care of that the previous day!). After breakfast we became more goal-oriented, and headed out to attempt to find the house in the Schmidtgasse where Onkel Hayn’s father had grown up, and which had been passed on to another of his sisters, Susanna Maria Eysenbach. Onkel Hayn didn’t give us a house number, but enough of a description that we think we may have found the site, but our guess is that the house no longer exists and has been replaced by a more modern one. We were particularly interested in this house because of the very unique home businesses that Aunt Eysenbach’s husband had operated. Unfortunately we will never know if Uncle Eysenbach’s silk worm project would have succeeded; he died at an early age and his wife had no interest in continuing the experiment. She did however keep the chocolate factory going, which we know from letters written by her sister’s grandchildren, who were there for visits. She herself had no grandchildren. She outlived all nine of her children, losing the last when he died at age 40, making her a rich woman. 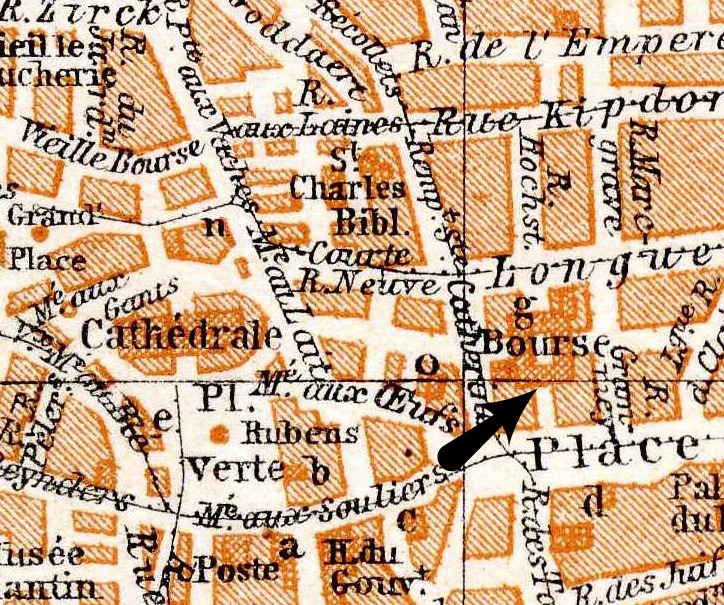 She became a patroness of the city’s first kindergarten, which was built in 1873 to give the children of lower-income families a place to go while the mothers were working in the factories. The interest from her endowment sufficed to pay for the upkeep of the kindergarten for many years, until the money was lost in the two World Wars. 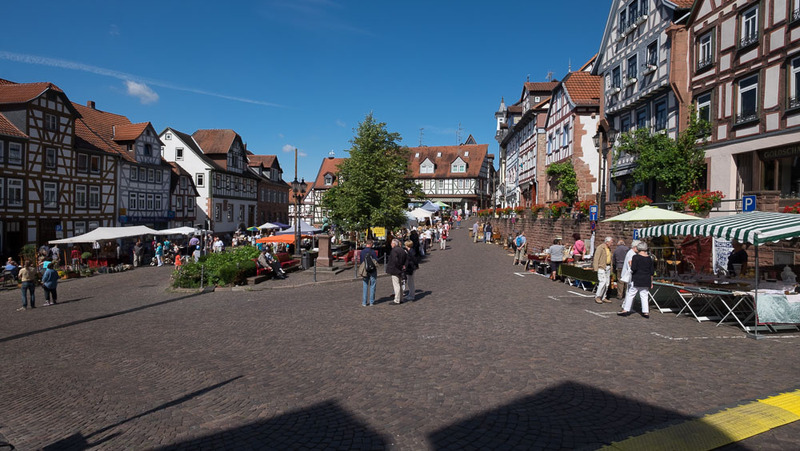 The kindergarten is now supported by the town of Gelnhausen. 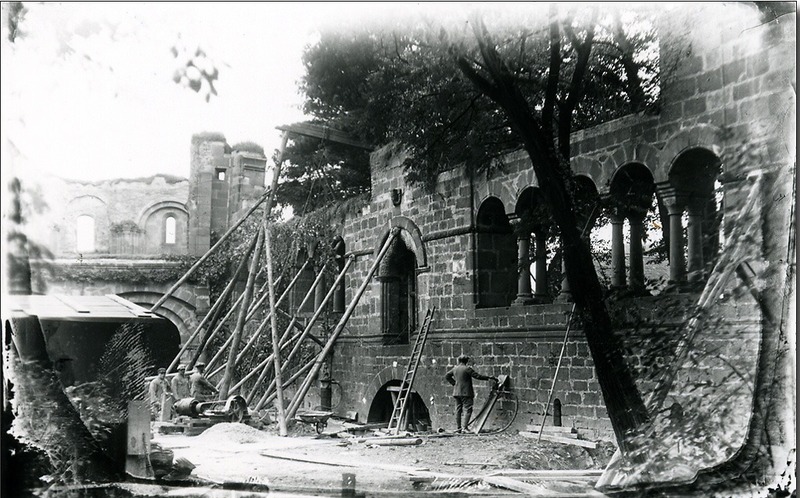 Another example of money earned abroad flowing back to Gelnhausen was the restoration of the Marienkirche between 1877 -79. One of the four spires had become twisted over the centuries and by the middle of the 19th century was in danger of collapsing. A large part of the funds raised for the renovation came from the Schöffer/Becker family. The leaning tower may gone, but the ruins of the “Barbarossaburg” are still there and well worth a visit. We had just enough time before getting back on the highway to take a tour of the museum and climb what is left of the tower. 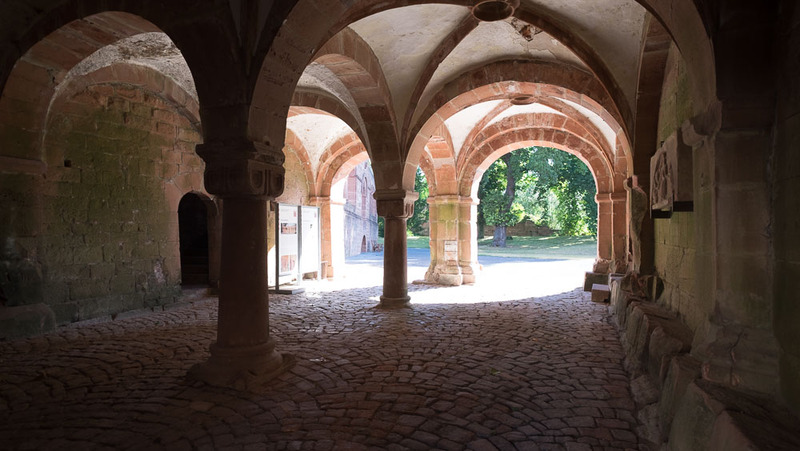 Built between 1170 -1180 for Frederick the First (Holy Roman Emperor from 1155-1190), the palace lies just south of the city gates on what was once an island in the Kinzig river. 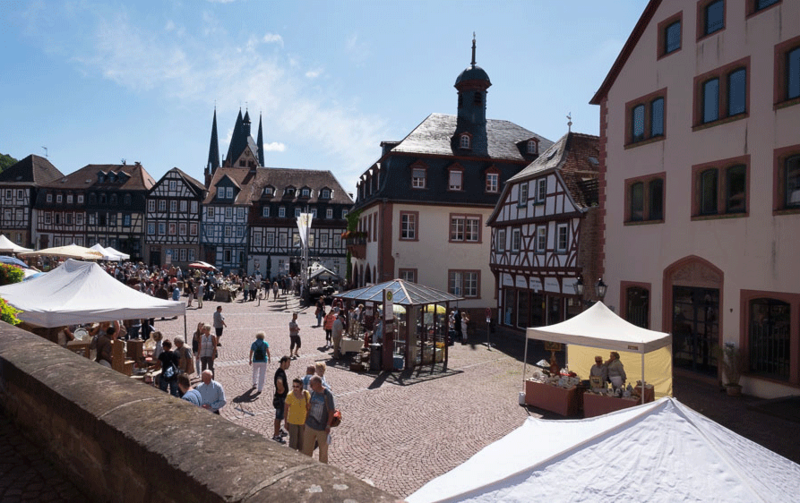 I don’t usually find castles and palaces very interesting, and ruins even less so, but I suppose my interest in Gelnhausen spilled over and gave me an appreciation I might not otherwise have had. Apparently Barbarossa (so named because of his red beard) also liked this particular palace, as is proven by the number of times he stayed here (more often than not he was either on a crusade or checking up on the rest of his kingdom). Since there is a lot written elsewhere about both the emperor and the palace (for those with a real interest in art history, check this out), I will not go into detail, but simply share a few photos. Entrance; the chapel is directly above. 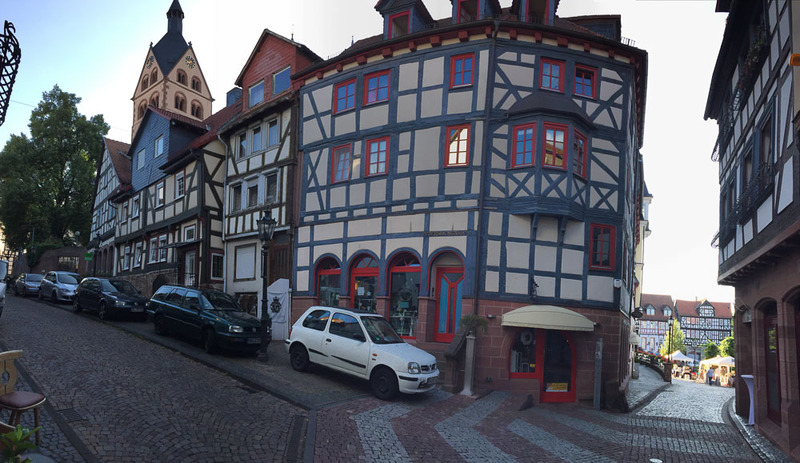 So that completes the recap of our first visit to Gelnhausen, following in Onkel Hayn’s footsteps. We are already planning our second trip! Will the real Heinrich please stand up? Anyone who has dabbled in genealogy knows that naming conventions in the early 19th century were rather complicated. Multiple first names were the norm, favorite names were often bestowed upon several children in the same family, and the likelihood that a child went by the first of their many names was actually quite slim. Take “Heinrich” in Onkel Hayn’s family for example – it was given three times, to Johann Heinrich, Heinrich Wilhelm, and Georg Heinrich Hermann. So which one actually went by the name of Heinrich? Not Heinrich Wilhelm but his older brother Johann Heinrich. Heinrich Wilhelm was of course the author of the memoirs and went by the name of Wilhelm, and his younger brother, the one with the three middle names, was Hermann (logically, as his other two names were already taken by his older brothers!) The confusion continues with all the other siblings – for example, Caspar Carl August Hayn was Carl, but Caroline Dorothea Elisabetha was Caroline (well, in the family she was known as Lina, in fact all the women seemed to go by nicknames). But the prize goes to Onkel Hayn’s father’s sisters Elisabeth Susanna and Susanna Maria, both of whom went by the name Susanna. Luckily they came up with a solution – the former was known as “Sannchen” and the latter “Suschen.” I wonder if there was any cat-fighting before they worked that one out? Posted in Daily Life, Family Life. Bookmark the permalink. There are now many facilities afforded for reaching Brussels from London by the various routes; but at one time this well known Belgian boat was the most popular way of so doing. The travelling public are also apparently less exclusive in their patronage at the present day; and a journey thither no longer means a pleasant sail down the river on a Sunday morning; a capital dinner and a bottle of wine with a “bon vivant” Captain at the head of the table, and merrily reckless of the ” mal de mer” to follow. Passengers now are more chary of their time and stewards’ bills, which it must be remembered on any of the boats occupying much time in the voyage, form no unimportant item in one’s travelling expenses. The Baron Osy, nevertheless, is too comfortable a vessel not to be able to command at all times a full share of patronage from those who choose this route. She leaves St. Katherine’s wharf at 11 o’clock a.m. on Sunday, arriving at Antwerp the next morning, and returns at mid-day on Wednesday. The original Baron Osy was built in 1840 and ran until 1874, with a short break in 1863 for repairs after it was sunk in the Thames River. 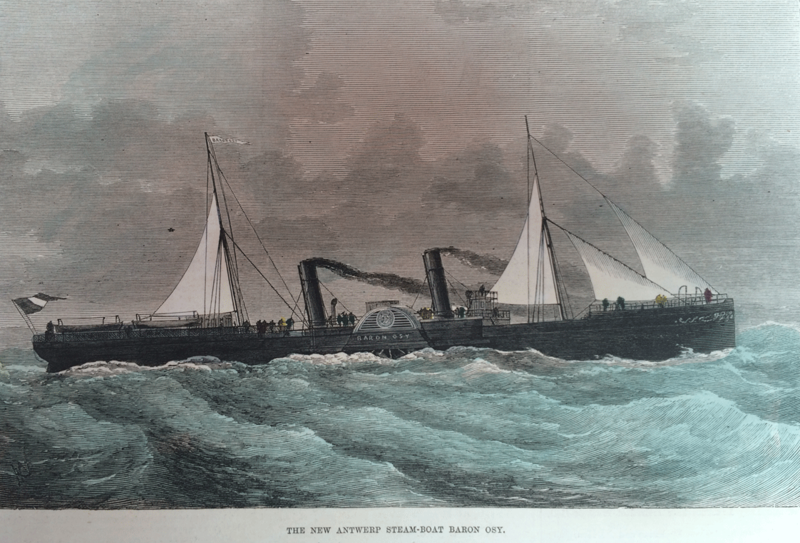 A photo of this ship can be viewed here and is the vessel that Onkel Hayn would have taken on his trip to London from Frankfurt in 1868. The present vessel has been built and fitted with all the improvements which long experience in the service has suggested. Her principal dimensions are – length, 245 ft. over all, 30 ft. beam, 15 ft. depth. She has a long, full poop* (unusually lofty and well-ventilated), fitted up in a sumptuous manner for first-class passengers, with a large smoking-cabin on deck. She has a bridge-deck extending the full length and width of the wing houses, forming together with the poop (which is connected by a gangway), a splendid promenade for passengers. The whole of the space under the bridge is fitted for the carriage of horses; arrangements are also made for carrying cattle. In the fore part of the vessel very comfortable and airy accommodation is provided for second-class passengers. Sounds like not a bad way to travel, as long as the horses and cattle don’t smell! Posted in Daily Life, Travels and tagged transportation. Bookmark the permalink. 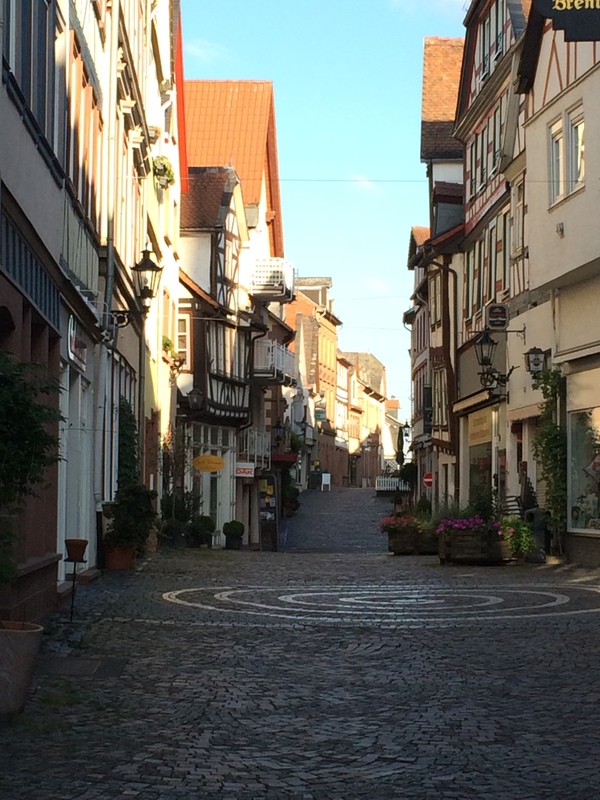 Since Gelnhausen is where Onkel Hayn’s narrative begins, it seemed only fitting that it should also be the first place we visited in our quest to re-trace some of his footsteps. Of course the opportunity to connect with distant relatives and attend a concert in the villa built by Onkel Hayn’s cousin C.H. Schöffer was an added incentive. And so it was that we made our initial acquaintance with Gelnhausen this summer during the annual “Sommersalon”. And I must say our first impression of the town was extremely positive. We arrived on a blustery July day just past noon, weary from traveling, and having done very little in the way of prior planning. 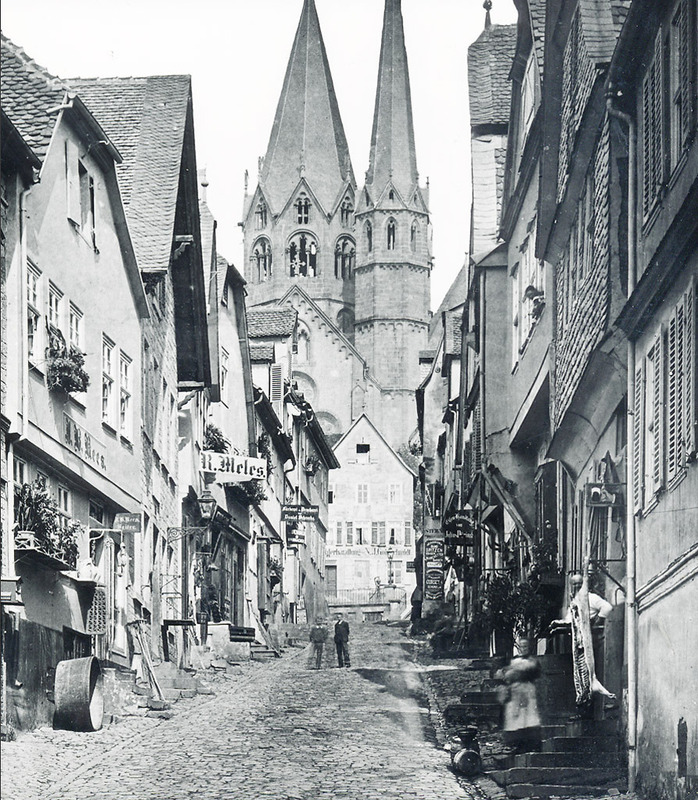 The first surprise was discovering that the hotel reception was closed between 11am and 4pm, the second was realizing that our choice of restaurant was on the street where Onkel Hayn’s aunt Schöffer (his father’s sister) once lived. 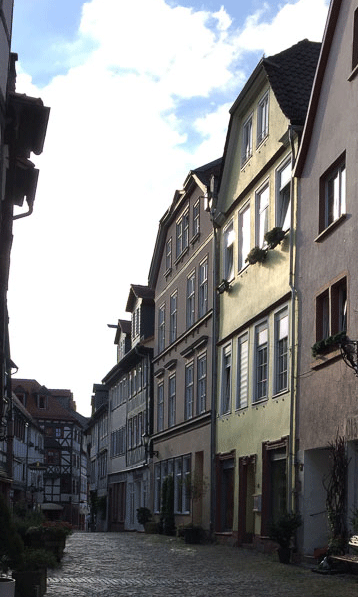 A short stroll after lunch took us to house 17, still very much as it was (as are many of the buildings in Gelnhausen), except for its freshly painted façade and modern windows. 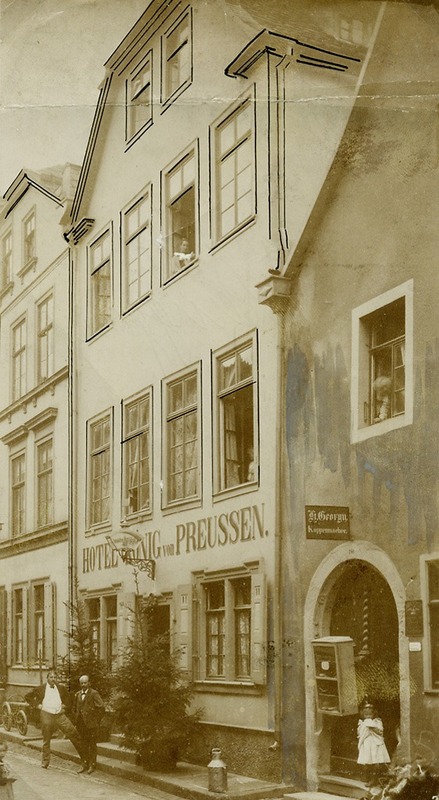 As a comparison, an historical photo of the building from around 1900 when it was named “Hotel König von Preussen”. 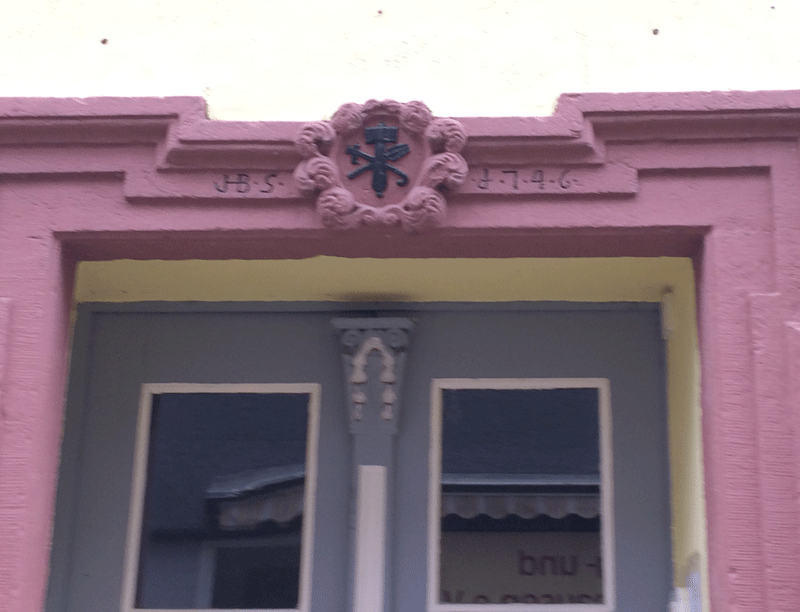 The initials of the original owner, Hans Bernhard Schmidt (a Schöffer ancestor), and the date 1746 are visible above the doorway, along with a symbol which identified him as a cooper by trade. Our next goal was what is now referred to as the Weisse Villa, built in 1865 by Conrad Heinrich Schöffer, son of the above-mentioned aunt. From old photos we had seen, which showed the building surrounded by a vast vineyard, we expected to have to drive to get there. So it was quite surprising and incongruous to find it only five minutes on foot from the center of town. Now integrated into the street system, with no grapevines in sight, the villa is rather out of proportion with its surroundings, but has lost none of its grandeur and elegance. With a slight feeling of trespassing, we climbed the steps to the house, by-passing the front door and heading for the side of the house with its manicured lawn and fountain. This is where we had arranged to meet my husband’s distant cousin, Dr. Kristina Michaelis, the great-great-great-great-granddaughter of Conrad Heinrich Schöffer, and author of the book “Die Gelnhäuser Grossbürgerfamilie Becker und Schöffer”. She is also the organizer of the summer concert series which takes place each July at the villa. We had been in touch by e-mail, but never met in person, so we were very much looking forward to making her acquaintance. How often do you get the chance to connect with a relative whose common ancestors were born more than 200 years ago? Not finding Ms. Michaelis on the grounds, we ventured inside, and received our first impression both of the opulence the villa had once enjoyed, and the neglect it had suffered. 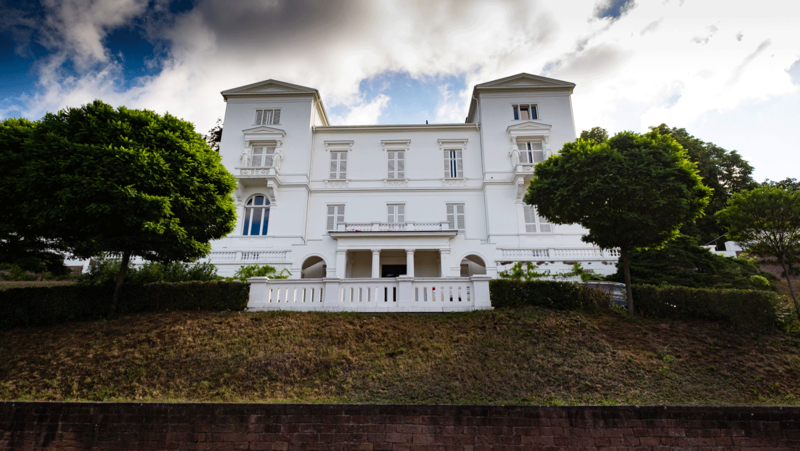 Sold by the family in the 1920s, it fell into a state of disrepair, and in the 1970s was in danger of being razed (a fate that unfortunately befell the smaller villa built by C.H.’s brother Wilhelm on an adjacent property). Thankfully the current owner is now in the process of restoring the house to its former glory, bit by bit. Hence, the main entrance and staircase have the air of an abandoned haunted house, but as soon as one reaches the upper landing, it becomes immediately apparent what a magnificent home it must have been. Although the rooms are no longer furnished in Victorian style, and one of them has been transformed into a modern kitchen, much of the original architectural detail has been preserved or restored, and the general sense of what it must have been like in the 19th century retained. Being situated on a hill, the second floor has access to the grounds from three sides of the house, with the windows on the south side offering magnificent views across the Kinzig valley toward the Spessart hills. It is truly the perfect setting for concerts and lectures – spacious rooms, polished wooden floors, high ceilings, and the chance to wander outside with drink in hand prior to the concert and at intermission. (For more information about the Sommersalon, including photos of the villa, see their Facebook page). We definitely plan to return again next summer! As it turned out, we didn’t have a chance to chat with Ms. Michaelis until after the concert, when she was able to step out of her organizer role and unwind over a glass of wine. In fact, she was late joining us, so we first had a few glasses with her father Jürgen, who was mayor of Gelnhausen for 30 years. There is certainly no better way to learn about a town than hearing stories from someone like him. I also got a kick out of knowing that I was sitting with a present-day mayor, and a descendant of an 18th century mayor (my husband) – so why didn’t I take a photo??? ?